Das Reich Kalifen in seiner grossten Ausdehnung. 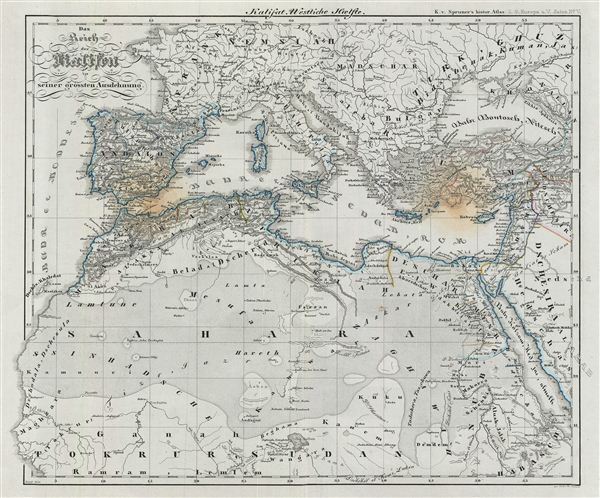 This is a fascinating example of Karl von Spruner's 1855 historical map of the Mediterranean during the rule of the Caliphs. The map covers from France to the Sahara Desert in Africa and from Western Arica to Syria, including the modern day countries of Morocco, Algeria, Libya, Tunisia, egypt, Spain, Portugal, Italy, Greece, and Turkey. The map depicts the Caliphate at its greatest extent. After the first four caliphs (632-661), the Caliphate was ruled by Dynasties. The major dynasties to claim the Caliphate were the Umayyad, the Abbasid, and finally the Ottoman. As a whole the map labels important cities, rivers, mountain ranges and other minor topographical detail. Political and regional boundaries are outlined in color. Relief is shown by hachures, and the whole is rendered in finely engraved detail exhibiting throughout the fine craftsmanship for which the Perthes firm is best known. Prepared by Karl Spruner for publication as plate no. V in the second edition of Justus Perthes' 1854 Historisch-geographischer Hand-Atlas zur Geschichte der Staaten europa's vom Anfang des Mittelalters bis auf die Neueste Zeit. Spruner, Karl, Historisch-geographi scher Hand-Atlas zur Geschichte der Staaten Europa's vom Anfang des Mittelalters bis auf die neueste Zeit, 1854. Very Good. Original centerfold. Original platemark visible. Blank on verso. Minor overall toning. Minor foxmarks near Spain and Cyprus.